Please refer to our stock # 395 when inquiring. Harriet W. Frishmuth (American, 1880-1980), titled Crest of the Wave, signed and dated 1925 on bronze base and with QFHL stamp and Gorham Co Founders foundry mark on bronze base; ht. 21.5, wd. 5, dp. 5 in. In excellent condition with a beautiful original patina. Harriet Whitney Frishmuth was born on September 17, 1880 in Philadelphia, Pennsylvania. A student of such renowned artists as Auguste Rodin and Gutzon Borglum, Frishmuth's reputation and career grew steadily throughout the first several decades of the twentieth century, with exhibitions at the National Academy of Design, the Academy of Fine Arts in Philadelphia, the Salon in Paris, the Golden Gate International Exposition (1939-1940) and the National Association of Women Painters and Sculptors. Her favorite models were dancers, especially Desha Delteil - immortalized in Frishmuth's most famous work, The Vine - a model particularly popular with artists for her ability to hold difficult poses for long periods of time. The final exhibits of Frishmuth's work took place in New York City in 1929, but she remained active in the art world for many years following. Frishmuth passed away in 1980 at the age of 99. 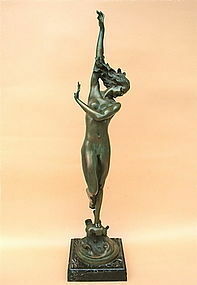 A proponent of the Beaux Arts style - Frishmuth was exceptionally critical of modern art, often calling it "spiritless" - her works can now be seen in some of the world's leading museums and collections, including the Metropolitan Museum of Art in New York City, the Dallas Museum of Art, and Ohio University's Kennedy Museum of Art.